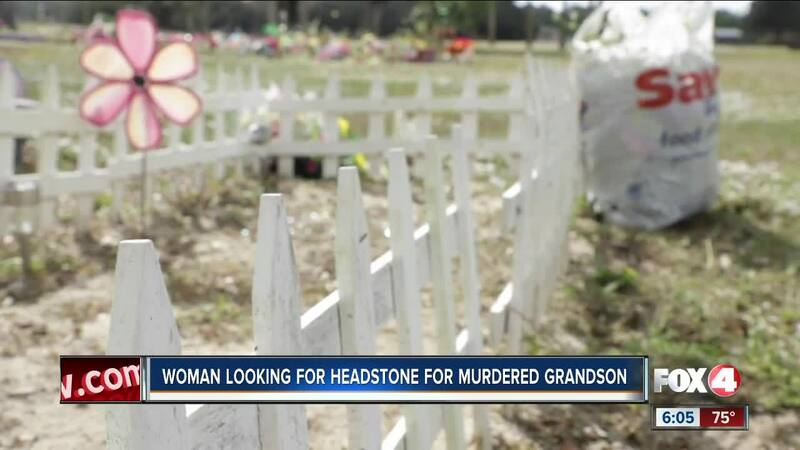 LEE COUNTY, Fla. -- A Southwest Florida grandmother is still trying to get a headstone for her grandson after he was murdered almost a year ago. A small white picket fence is currently the only part that stands out on Bobby Morrison's grandson's grave. She lost her grandson, Eric Young, Jr., last December. He and Samuel Jones were shot and killed in a Lehigh Acres home. "He came home and said 'Grandma, I'm going to the basketball game'. And I said 'Okay son, you be careful. I'll see you later'. And later never came." It's been almost a year since Eric's death, but there's still no gravestone. Bobby paid $1,800 for a ledger and her son and his wife paid $720 for a headstone from Hickson Funeral Home back in March. But it still hasn't arrived. "It's past time. And I'm not getting an explanation as to why," says Morrison. They wanted the design to be detailed, featuring wings in the shape of a heart around a picture of her grandson. Edward Hickson, owner of Hickson Funeral Home, didn't want to be interviewed but said an intricate design like that takes time. Funeral directors we spoke to said an intricate design could take anywhere from six months to a year to complete. And Hickson says he told the family it would take a while for a design like that. "I'm just getting story after story after story," says Morrison. All she wants is answers. "I come out here and I talk to him. And I just sit sometimes. But like I said I would like to look at his slab and his stone, he's supposed to have his picture on it. I would like to see something over his grave, ma'am."